Anicca Jansen was a member of USAID's Office of Microenterprise Development from its launch in 1994 until her retirement from government service in June 2013. During that time she managed and monitored several Implementation Grant Program grants which supported the development of microfinance institutions. With a heavy focus on Africa and Haiti in the early years, her work later expanded to Eastern Europe, Haiti, and the Mideast. From 2001 to 2004 Anicca served as USAID's West Africa Regional Technical Advisor for Microenterprise and Microfinance. 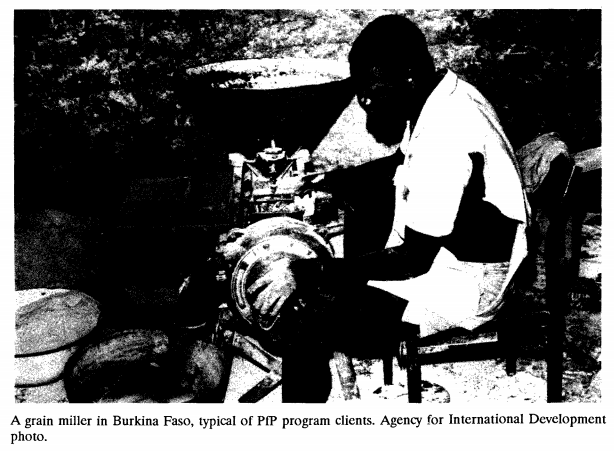 USAID supported small enterprises and their access to finance since its creation in 1961, but it was in the 1980s that support became more deliberate and focused. As Beth Rhyne1 put it, “Small enterprise stood at the intersection of two primary (but often conflicting) A.I.D. objectives, its legislative one of reaching the very poor, and the administrative one of promoting the private sector.” Click here to read full document. This was a critical time for USAID and the broader development community to gain a richer understanding of microenterprises and their importance to both urban and rural economies, farm and non-farm households. From 1978 to 1990, USAID supported the Small Enterprise Approaches to Employment (SEAE) project, originally through the Office of Urban Development. The two major components of the SEAE project were PISCES I and II (Program of Investment in the Small Capital Enterprise Sector) followed by ARIES (Assistance to Resource Institutions for Enterprise Support). Meanwhile, the Office of Rural Development also supported the Off-Farm Employment Project, led by Carl Liedholm at Michigan State University (MSU). [Experiments in Small and Microenterprise Development]. During the life of the SEAE project, the Office of Urban Development merged with the Office of Rural Development to create the Employment and Enterprise Development Division, broadening the focus beyond the urban informal sector to include rural, off-farm enterprises and employment. While PISCES and the MSU work focused on better understanding enterprises through case studies and evaluations, ARIES2 was designed to understand and strengthen the organizations that were implementing micro and small enterprise projects. ARIES provided training and technical support to implementing partners such as CARE, Catholic Relief Services (CRS), Freedom from Hunger, Save the Children, and the local partners with whom they worked. In addition to increasing understanding of microenterprises, these projects raised the issues of cost-effectiveness and financial self-sufficiency. Private voluntary organizations (PVOs) and non-governmental organization (NGOs) became more aware and accepting of the need for cost-effectiveness. In addition, the idea of developing self-sufficient financial services providers, with cost-covering interest rates, became more widely accepted. In 1987, the first legislation directing USAID support was enacted as part of a continuing resolution for the 1988 fiscal year. USAID was directed to spend US$50 million for the provision of credit and other assistance to microenterprise, which would increase to US$75 million in fiscal year 1989. No additional funding was provided, but rather USAID was instructed to use existing appropriations to carry out microenterprise programs. What has been the greatest influence on USAID programming: Was it research, field experience, or advocacy? Midterm evaluation of the Assistance to Resource Institutions for Enterprise Support [ARIES] project. Gerald A. Barth. Options for updating askARIES. An Analysis of Cost Effective Means of Disseminating Microenterprise Information. GEMINI Working Paper No. 7. Larry Reed. Searching for Benefits. Peter Kilby and David D’Zmura. askARIES Field Test Final Report. Charles K Mann, et al. Experiments in Small and Microenterprise Development. Galen Spencer Hull. AID Microenterprise Stocktaking: Synthesis Report. December 1989. James J.Boomgard. 1 Now Managing Director, Center for Financial Inclusion at Accion. 2ARIES was contracted to Robert R. Nathan Associates, with subcontracts with Control Data Corporation, Harvard Institute for International Development, and Appropriate Technology International. 3Congressman Leland died in 1989 in a plane crash while on route to visit Sudanese refugees in Ethiopia. His legacy lives on in a number of ways, including through the Mickey Leland Center on World Hunger and Peace and connectivity created through USAID’s Leland Initiative. Studying the Past, Looking to the Future: Why Was It Called The Office of Microenterprise Development?